Replacing the heat lost through windows can be expensive. And with an ever increasing environmental awareness, coupled with the recent rise in energy costs, more emphasis is now being placed on ways to save energy in all types of domestic, commercial and public buildings. Thermal glazing solutions are now playing an ever important role in improving the energy efficiency and insulation in homes. As a high percentage of heat is lost through windows, replacing existing single glazed window glass with Pilkington energiKare™ thermally insulated windows could help reduce the amount of energy lost by up to 75%, lowering heating bills by up to 20% each year. The Pilkington energiKare™ range of energy-efficient glazing solutions is suitable for every type of property, providing a glazing solution that comes in various thicknesses and glass product combinations. 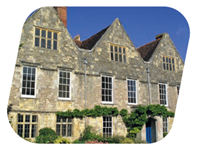 Pilkington Spacia™ insulating glass units – offer an ultra-thin solution ideal for upgrading single glazing to double glazing in older traditional properties – helping to retain their original aesthetics. Pilkington energiKare™ Triple is the perfect solution when a high performance triple glazed units are required. Pilkington energiKare™ differs from basic glazing as it works in two ways. It reduces the amount of heat lost through windows, but also allows more heat (energy) from the sun in through the glass. This effect is known as solar gain and you’ll benefit from its effects all year round, for free. 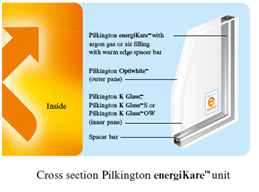 Pilkington K Glass™, Pilkington K Glass™ S or Pilkington K Glass™ OW make up the inner pane of the double glazing unit and its primary function is to prevent heat escaping through your windows and return the heat back into your home. Pilkington Optiwhite™ makes up the outer pane of the glazing unit and has special “extra clear” properties, which allow more light and heat from the sun to enter into your house through your windows. Suppliers of Pilkington energiKare™ can be found nationwide. Click to find your nearest installer. To learn more about our glazing systems please visit our product directory. And to see what costs could be saved by using Pilkington energiKare™ in the home, try our energy saving calculator – simply select your property type and the conditions that best match your home.